Row 1 chain 3(this counts as first double crochet)double crochet 3 more times into the first chain of the foundation row. Chain 3 and double crochet into the same space * skip 4 chains and double crochet 4 times into the next chain of the foundation row (Chain 3 and put 1 double crochet into the same space *) repeat from*to* end of row and turn. Row 2 chain three (this counts as first double crochet) double crochet into chain 3 from the previous row three times and chain 3 then double crochet into the same space. 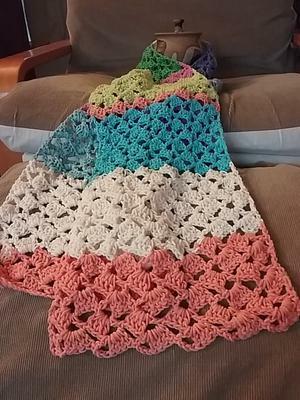 In the next chain 3 work space work 4 double crochet. Chain 3 and double crochet all in the same space* repeat from*to* end of row and turn. Remaining rows are worked as row 2.